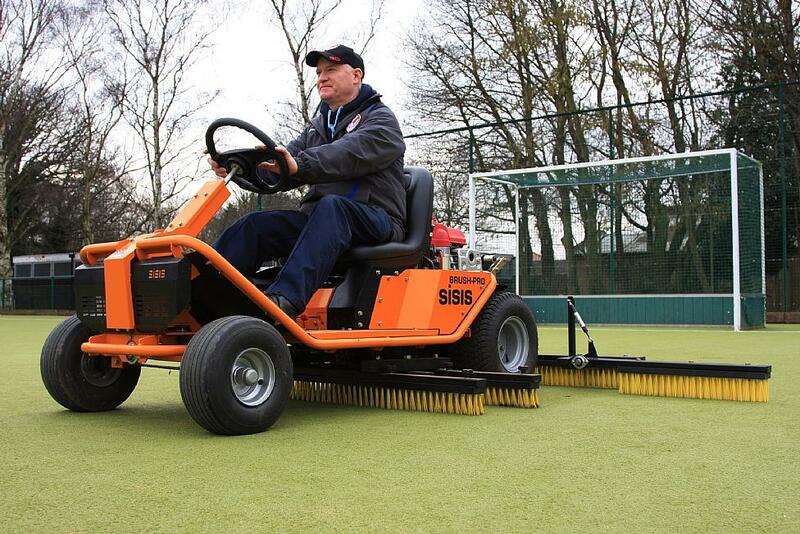 Garry Watson, head groundsman at King Edward’s School in Birmingham, has chosen the SISIS Brush-Pro ride-on brushing system, for all his synthetic surface maintenance. Situated on a beautiful 50 acre site in Edgbaston Park Road Birmingham, lies two esteemed independent schools. The boys’ school, which was founded by King Edward VI in 1552, and the girls’ school which was established in 1883. The two schools boast extremely high academic standards and are both consistently placed with the leading schools in national league tables. The schools also pride themselves on the wide variety of opportunities they provide for enrichment outside the curriculum, which includes a number of sports. Facilities for rugby, cricket, football, hockey, tennis and athletics are all included at King Edward’s School and overseeing the maintenance of all of these pitches is Garry along with eight members of staff. Among these facilities are three synthetic surfaces which are solely used for hockey. Two are situated at the girls’ school and quite recently the boys’ school had a sand based pitch constructed. All of these pitches see a tremendous amount of usage with school teams playing on them throughout the day and local hockey clubs hiring them out in the evening. It is a very common misconception that synthetic surfaces require very little attention but just like natural turf, synthetic surfaces require maintenance as soon as they are constructed if they are to perform to the standard expected of them. Regular and periodic upkeep is required because it ensures a safe playing environment, retains the performance characteristics as well as prolonging the longevity of the surface. With this in mind, Garry needed an improvement on his previous machine to keep his synthetic surfaces at the highest possible standard – and this led him to the SISIS Brush-Pro. 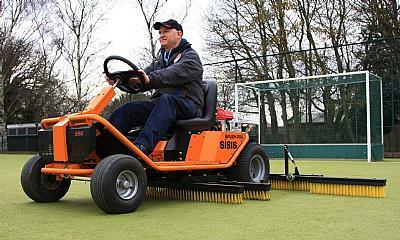 The SISIS Brush-Pro is a ride-on brushing system comprising a pair of mid mounted oscillating units and three rear mounted brush units that that have been specifically designed for maintaining synthetic surfaces. Upon seeing a demonstration of the SISIS Brush-Pro, Garry was so impressed that he decided to purchase not just one, but two of them. Brushing synthetic surfaces is essential to keep infill mobile, lift the pile and prevent algae accumulation, surface compaction and loss of porosity. The Brush-Pro has been designed for maximum manoeuvrability and operator comfort with features such as an electric start, hydrostatic drive for forward/reverse and its brush combinations - oscillating for thorough periodic work and rear mounted brushes for routine frequent work which cause less compaction than conventional drag brushes. “I wouldn’t hesitate to recommend this product,” said Garry.